For most online marketers, getting customers to enter their payment details and click “purchase” is the ultimate conversion. 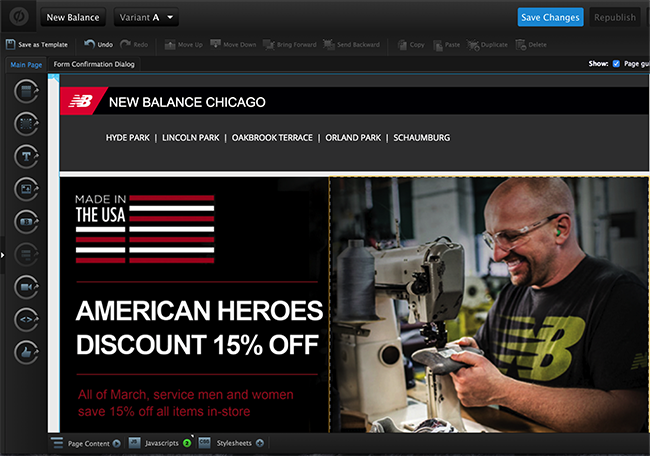 But for New Balance Chicago, online sales aren’t the goal at all. 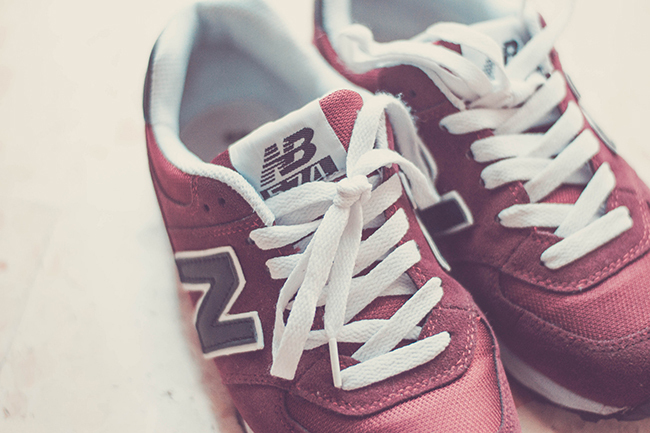 Chances are you’ve worn a pair of New Balance sneakers or know someone who swears by them. Headquartered in Boston, New Balance is an international, 109-year-old brand endorsed by Welsh footballers, Canadian tennis stars and American baseball players. Image by Alicia A. L. via Flickr. In the Chicago area, however, New Balance’s brick-and-mortar stores are owned and operated as a family business – with a local marketing budget. Although they do get a cut of the ecommerce sales that come through their online channels, their primary goal is getting people’s actual feet in the literal door. So you can understand why, until recently, online marketing seemed like more of a distraction to the company than an opportunity. Over the course of a few months, Brian’s team tackled those challenges feet first. Using a combination of targeted Facebook ads, campaign-specific Unbounce landing pages and personalized emails, they were able to generate hundreds of leads and drive thousands of dollars in sales at half the ad spend. 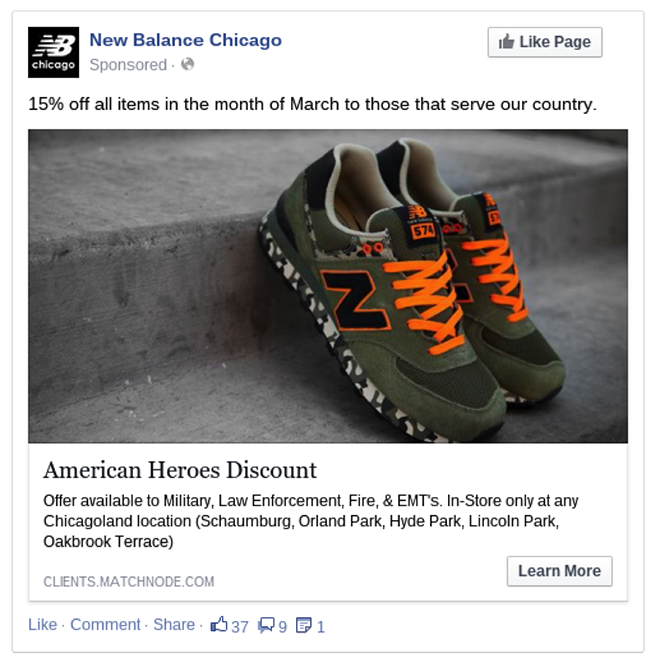 Match Node’s original strategy for New Balance revolved around Facebook Offers, which allow marketers to embed discount codes in Facebook display ads. Looked similar to previous New Balance customers: Using Facebook ad targeting, they created a “lookalike audience” based on customer emails, which the stores had been collecting at checkout. Had relevant interests like “fitness” and “Chicago marathon” listed in their profiles. The ads reached 136,541 people and resulted in 600 offers being claimed. This generated more than $5,000 in sales, which Davidson considered a success. In fact, they were only able to track 32 individual purchase codes. The problem was that in order to track the codes, the company had to rely on customers and clerks taking the time to report the discount codes at the point of purchase. The codes themselves were unique, but the 15% discount was promoted on various channels, meaning customers could have heard about the sale in a number of places. They could have tracked the codes using customer emails, except Facebook won’t give advertisers the names or email addresses of users who download coupons. Despite the campaign’s relative success, using Facebook Offers proved to be a frustrating experience for a data-driven, optimization-minded marketer like Brian. Another limitation of the Facebook Offers strategy was that there was no relevant online destination to send users to once they claimed the coupon. Directing them to the New Balance website was out of the question since it only increased the likelihood of an online purchase, which didn’t benefit Brian’s client. It also didn’t give them the opportunity to create a dedicated experience for each specific campaign. Moreover, given that the majority of Facebook ad clicks came from mobile users, sending potential customers to a page that wasn’t optimized for mobile users would have been like “cutting off our nose,” says Brian. Suddenly, that was no longer a problem. 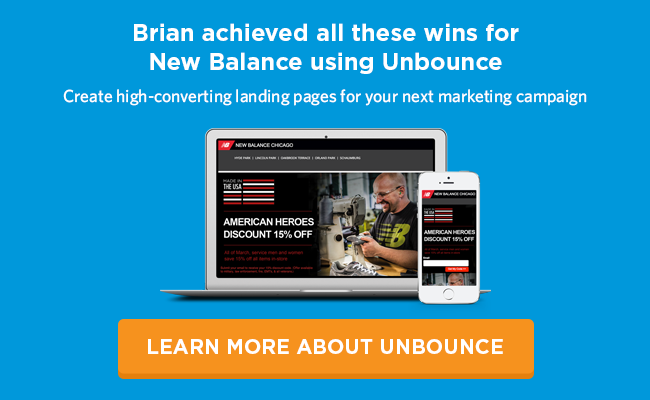 Using Unbounce’s landing page builder, Brian says his designer “virtually cloned” the national New Balance website as a starting point, but then made a few key tweaks to make sure it was optimized for offline conversions. Instead of website navigation and links to purchase products online, the page featured information about New Balance’s Chicago stores, including Google Maps, phone numbers and in-store benefits like old-school fittings, something few other shoe stores offered. Pssst. Need a flexible landing page template that allows you to maintain your or your client’s brand identity? Unbounce gives you hundreds of beautiful templates to start from and customize with a simple drag n’ drop interface. Check them out! Aimed at an ultra-targeted audience of 45,000 military vets, the ads generated more than 200 coupons, which were sent to leads after they entered their emails on the landing page. This meant that instead of crossing their fingers that people would print out the coupons and bring them into the store, they were able to collect the emails of interested buyers – and follow up with them. 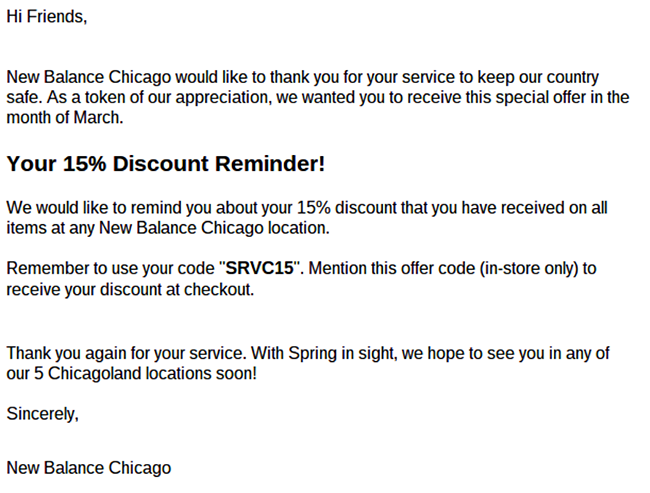 In just two months, New Balance Chicago’s email list grew by more than 10%. With these emails tied into specific campaigns, they were able to go “one step further in the funnel” and send out reminder emails, urging leads to claim their discounts. 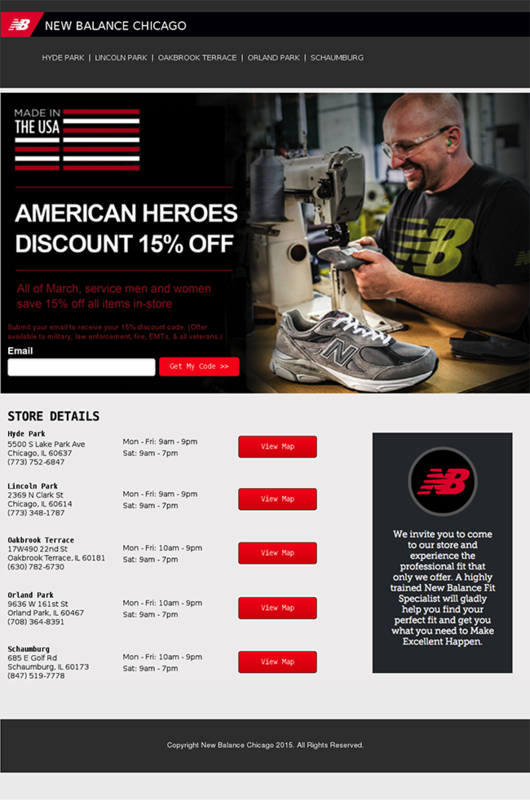 Open rates for these reminder emails were 5-10% above New Balance’s regular promotional emails, says Brian. The lead gen component of this strategy was the cherry on top for Brian’s client. Pssst. 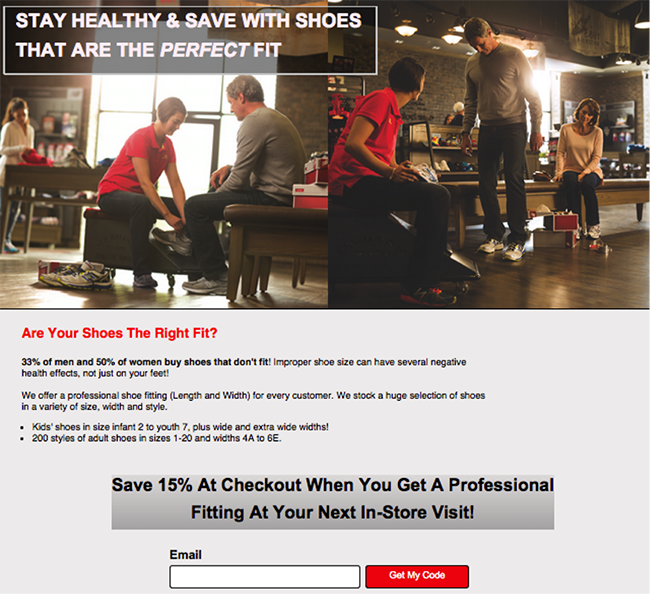 Want to generate more leads like New Balance and then nurture them into paying customers? 31.4 million leads have been generated using Unbounce, which integrates seamlessly with MailChimp, Marketo, HubSpot, Campaign Monitor, Constant Contact, InfusionSoft, AWeber, Salesforce and other marketing software. Start generating leads now. There’s one more element that made these campaigns so successful. Using Facebook’s ad platform, marketers can choose to optimize their ad spend either for clicks or for “website conversions,” which means actions taken outside of Facebook’s ecosystem. Once they started sending people who clicked on the ads to dedicated landing pages, Brian’s team could optimize their campaigns for landing page conversions, which is far more efficient than gunning for clicks. With this strategy, they were able to spend 50% less and drive 200% more in sales compared to the Facebook Offers campaigns they ran previously. The military veterans campaign was just the beginning. Using Unbounce, they could easily duplicate the original landing page and tweak the design for any other offer New Balance wanted to promote. 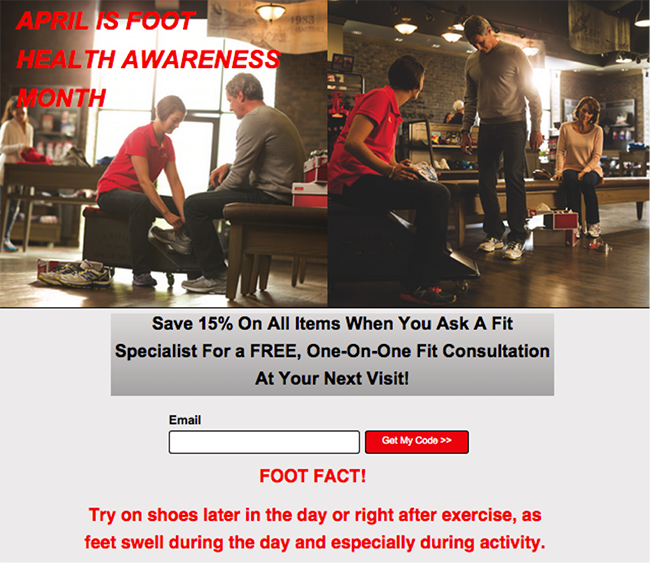 Throughout the year they’ve run successful promotions for everything from Foot Health Awareness Month, to athletic apparel, to kids’ shoes. They’ve perfected the formula along the way, testing copy changes (such as leading with the discount vs. leading with the “free fitting” benefit) and swapping out photos on the landing page to match the ads that Facebook’s algorithm identified as the most successful. By making incremental changes, Brian says they’ve been able to boost conversion rates by 5-10% throughout the course of a given campaign (which often translates to 5-10% more sales). The variant with the word “free” boosted conversions by 16%. That may seem fairly obvious, but it’s yet another reminder that once you have the right strategy in place, small steps can take you a long way. Using online marketing channels to generate in-store sales rather than ecommerce purchases. Finding an efficient way to track whether they were doing so effectively. Grow their email list with qualified leads. Reduce their cost per acquisition. Easily replicate and optimize their most successful campaigns. 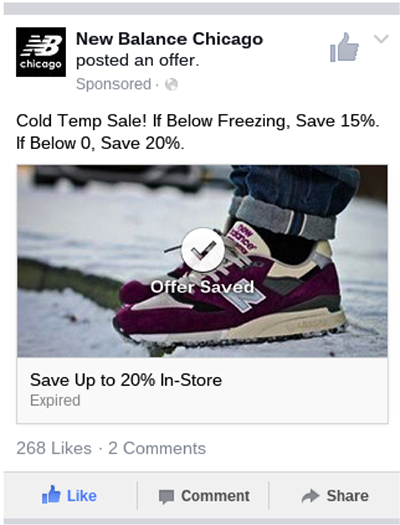 Needless to say, the folks at New Balance Chicago are digital marketing skeptics no longer. And lots of agencies would like to be in Brian’s shoes right now.